To honour and make excellent teaching performance visible, we award a € 2,000 prize every two years. Each award has its own specific focus. Course units can be nominated by teams of students, specialist field coordinators and heads of the degree programmes. Upon expiry of the nomination deadline, the nominated lecturers are expected to submit their teaching concepts, which elaborate on aspects relevant for assessment. Based on the concept and nomination, the submitted course units are assessed by a jury. The jury comprises members of the University of Applied Sciences Board, Executive Board and an external expert. 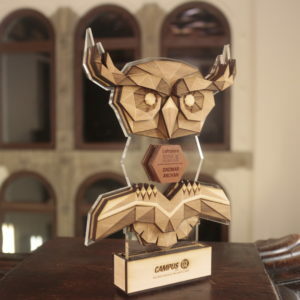 The focus of the assessment lies on the quality of the concept regarding the specific focus of the award as well as on its practical implementation at CAMPUS 02. The topic of CAMPUS 02’s first teaching award was “Using modern technologies in a meaningful way – improving learning results”. The CAMPUS 02 Teaching Award 2018 revolved around the motto “Enjoying Learning”.